Leo’s character Frank less sympathetic than April; April is at least tragic in a small-town, Madam Bovary sort of way (though she “sins” far less). What was the point of this film? I feel I’ve seen/read this story before. Many internal references to other films – deliberate I suppose. Based on a book from the early 60s, set in late 50s. But what does it have to say to us today? Perhaps this film is more relevant to a US audience? If this film had been made in US in early 60s I think it would have been scandalous and ground breaking (and would probably have existed in censored and uncensored versions). But today … it’s just a costume drama. It’s a good costume drama. Director Sam Mendes makes good costume dramas (thinking of Road to Perdition). But he’s made films that seem relevant too (American Beauty). This isn’t one of those. It is very true to its period though, perhaps overly so? Very stagey. For a Swedish audience Involuntary (De Ofrivilliga) has more of relevance to say. 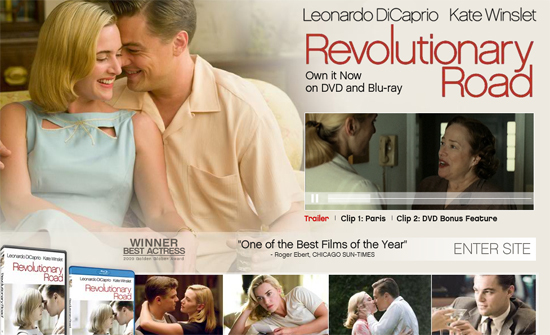 Revolutionary Road worth an Oscar as ‘best film of 2008’? – Oh, come on!! The above is a screen shot from the movie’s official homepage [which no longer seems to be up – here’s the film’s page on IMDb instead], the illustration of DiCaprio and Winslet is from the picture gallery on the same site. OK, having checked the Oscars site I see that Revolutionary Road has not been nominated as one of the best films of the year. A relief. I see it has been nominated in the catagories of Art Direction and Costume Design – so my “costume drama” reaction wasn’t so far off the mark. Michael Shannon (who plays the “Greek chorus – the lunatic son of the realtor”) is nominated as best supporting actor, with which I have no beef. My local newspaper, though, rates this film rather more highly. This morning’s edition includes a review awarding the film 5 points out of a possible 5, and the (middle class?) reviewer writes: The question of what is an authentic life is … just as relevant to the middle class of today. And Possibly the film would have been even more interesting if the neighbours had been genuinely happy with their choice of life (a life in the suburbs can be authentic). I just uploaded the illustration, so I’ll take the opportunity to add this note. I listened yesterday to Mark Kermode’s weekly film review podcast (now here) and was relieved to find he felt much the same way about Revoutionary Road as I do. Relieved because in this church, Dr Kermode is one of the greater prophets. Revisited and revised for spelling and SEO fine-tuning. Broken links to movie homepage and Kermode review removed. New Kermode link and IMDb link added. 12 Dec 2016.